Getatchew Mekurya (March 14th, 1935 - April 4th, 2016). Photo: World Music Network. 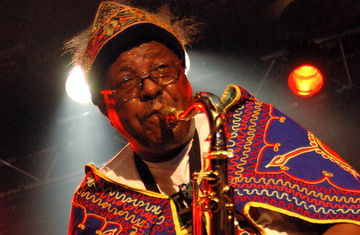 New York (TADIAS) — Legendary Ethiopian saxophonist Getatchew Mekurya passed away this week at the age of 81. Getatchew, who began his musical career in Addis Ababa in the 1940′s, was a member of Ethiopia’s famous Police Orchestra. However, Getatchew gained international exposure mostly in the past decade through his world tours in collaboration with the Dutch avant-garde band, the Ex, and the release of his album Negus of Ethiopian Sax as part of the Ethiopiques CD series. Getatchew Mekurya was also part of the historic outdoor Ethiopian concert at Lincoln Center here in New York City in 2008 that included Mahmoud Ahmed and Alemayehu Eshete.